Sarah Palin posted the following note of congratulations on her Facebook page to Ted Cruz who was victorious in his run-off in Texas today. Mr. Cruz (the future Senator Cruz) now goes on the ballot for the general election in November as the Republican candidate for U.S. Senate. Congratulations to Ted Cruz! This is a victory both for Ted and for the grassroots Tea Party movement. This primary race has always been about the kind of leadership we need in D.C. Our goal is not just about changing the majority in the Senate. It is about the kind of leadership we want. Ted Cruz represents the kind of strong conservative leadership we want in D.C. Go-along to get-along career politicians who hew the path of least resistance are no longer acceptable at a time when our country is drowning in debt and our children’s futures are at stake. The message of this race couldn’t be clearer for the political establishment: the Tea Party is alive and well and we will not settle for business as usual. Now, it’s on to November! Earlier this week, Governor Palin called out Rahm Emanuel’s Chicago-style thuggery for his support of banning Chick-fil-A from expanding there. The owner, with a record of good service, happy customers, and charitable contributions simply voiced his stand for traditional marriage. A politician attempting to bully a private business is unacceptable, but “merely more of the same,” the Governor articulated. Tonight, Governor Palin addressed an enthusiastic Texas crowd at a rally for U.S. Senate candidate Ted Cruz. Not long after taking to the podium, she mentioned that she’d stop by Chick-fil-A later to support the business. 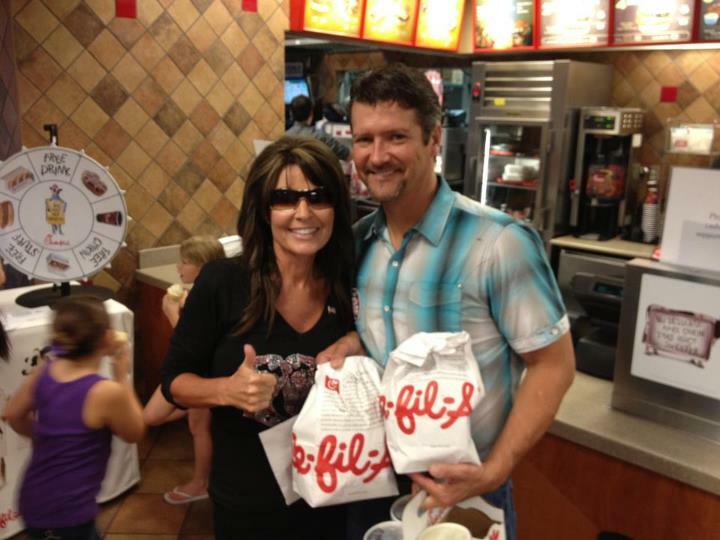 Palin also injected herself into the Chick Fil-A dustup over its owner’s support for traditional marriage. “Jason,” she said, talking to an aide, “you’re going to have to take me on our way back to the airport later. We drive [by] a Chick Fil-A. We don’t have that in Alaska. Love me some Chick Fil-A. So, we’ll go there, Jason, on the way, OK?” The crowd cheered. 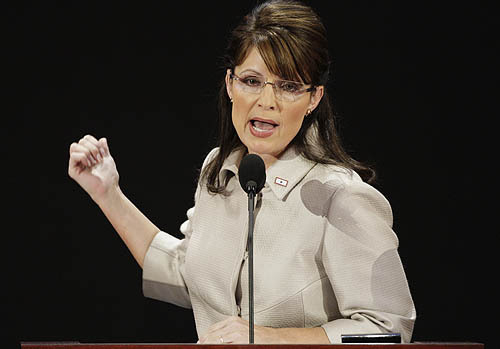 The article goes on to give a good run-down of Governor Palin’s fiery speech and includes several pictures. See for yourself here. Chick-fil-A has not only had to deal with Emanuel’s ridiculousness, but has endured the vitriol of others who have no tolerance for those who don’t agree with their worldview. In fact, as Twitchy reported, when Don Perry, Chick-fil-A’s Vice President of Public Relations, died suddenly today, many of these so-called compassionate liberals took to Twitter to spew their hatred and revel in his death. Once again, one reason I respect Governor Palin is she has the guts to consistently stand up for what she believes in, but she takes it a step further. It’s not just her own interests she looks out for. She stands up on behalf of others who are targeted by the hypocritical left, yet for this tendency to speak the truth she is called “divisive” and “polarizing”–adjectives she should wear as a badge of honor, considering they often come from those who have never in their lives stood up for anything that might cost them acceptance into the good old boys’ clubs for which they salivate. Governor Palin, on the other hand, isn’t interested in being in anybody’s club, particularly if it shackles her or robs her of her independent spirit. She refuses to sit down and shut up, and she puts her money where her mouth is. A woman of her word, she did drop by Chick-fil-A, and she shared pictures. Stopped by Chick-fil-A in The Woodlands to support a great business. Great to visit with the Sassy Feet dance squad at the Chick-fil-A in The Woodlands, TX. Tonight, Governor Palin stumped for Ted Cruz, candidate for U.S. Senate, at the Get Out the Vote Rally in Houston. 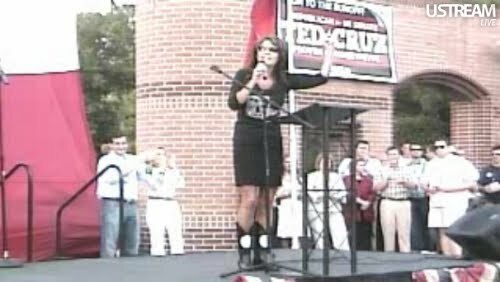 She gave one fired-up speech, totally fitting for an enthusiastic crowd of Texas patriots. These people want to see government restored to its limited role, Obamacare repealed, the Constitution honored, and spending sliced. They know Ted Cruz is the man for the job. Governor Palin lit it up for him in a speech that really speaks for itself. In a Facebook post from yesterday, Governor Sarah Palin reiterated her support for Ted Cruz, especially since early voting has begun. Early voting began yesterday in the run-off election for U.S. Senate in Texas. [It runs through Friday, July 27th.] Texans have a clear choice in this race, and I encourage them to support Ted Cruz, a strong conservative fighter who will protect and defend our Constitution and not just go along to get along with the reckless spending of the permanent political class in D.C. The high-paid consultants of Ted’s well-funded opponent are in full panic mode and have plunged millions of dollars into false personal attacks against Ted meant to dispirit us and break our conviction. We’ve all seen these tactics before, but together we can make sure they don’t succeed. I encourage Texans to get out and vote for Ted Cruz. P.S. : For those of you outside of Texas looking to support Ted you can do so by visiting his website here. The run-off election is Tuesday, July 31st. Governor Palin knows how important this is. Do you? Please support Ted Cruz in whatever way you can! Today early voting begins in the run-off election for U.S. Senate in Texas. Texans have a clear choice in this race, and I encourage them to support Ted Cruz, a strong conservative fighter who will protect and defend our Constitution and not just go along to get along with the reckless spending of the permanent political class in D.C. The high-paid consultants of Ted’s well-funded opponent are in full panic mode and have plunged millions of dollars into false personal attacks against Ted meant to dispirit us and break our conviction. We’ve all seen these tactics before, but together we can make sure they don’t succeed. I encourage Texans to get out and vote for Ted Cruz.